Multi Cone Circular Diffusers, designed to handle large volumes of air and distribute it evenly in a 360° pattern. Various blow patterns can be obtained by adjusting the core into or out of the frame simply by spinning it. 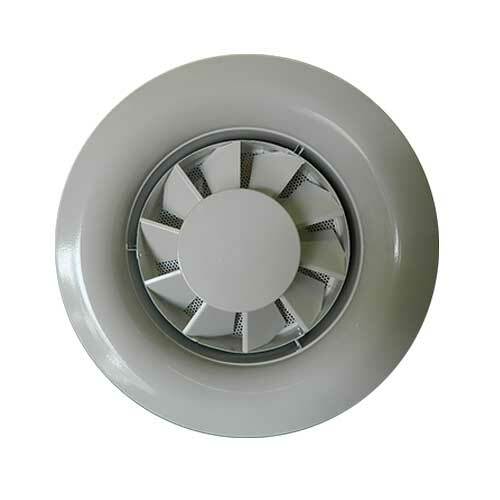 Circular diffusers manufactured with aluminium spinnings for the blades and frame with moulded plastic internal framework. Available in wide range of sizes and finishes, with automatic adjustment option. 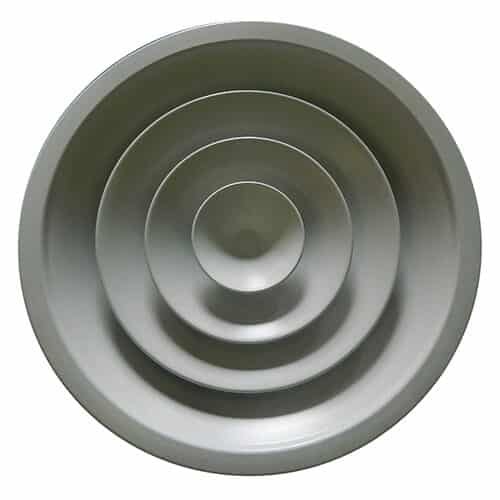 The CMD Circular Diffuser is a multi cone circular diffuser, designed with the capability of handling large volumes of air efficiently and the ability to distribute the air evenly in a 360° pattern. 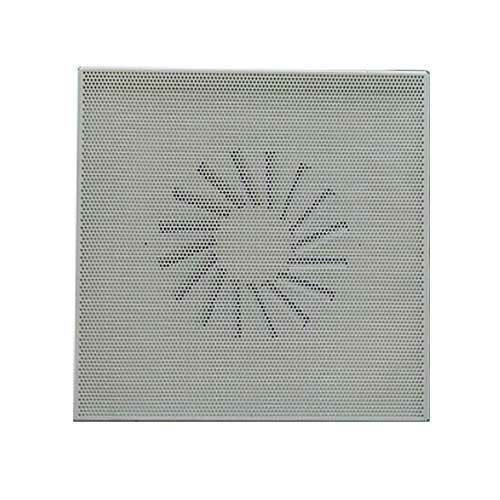 The diffusers can be used for both cooled air and warmed air ventilation systems. 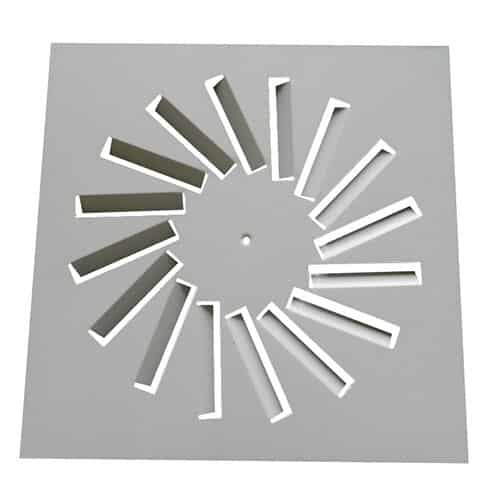 The circular diffuser has a fully adjustable central cone mounted on a thread mechanism. Various blow patterns can be achieved by simply spinning the cone into or out of the frame body. This ease of adjustment means that air distribution can be altered whenever required to suit the needs of the installation environment. Spinning the central core of the circular diffuser inwards produces a mostly vertical throw of air, which is ideal for spot cooling or heating where a more localised stream of air is required. Bringing the central core outwards until it is flush with the outer frame, creates an air throw with a balance between both vertical and horizontal projection. Extending the inner core further outside of the frame allows the blades to deflect the supplied air sideways for excellent diffusion. When the circular diffusers are installed in ceilings, this setting allows for the use of the condo effect to maximise the affected areas. As well as the ease with which our circular diffusers can be manually adjusted, we also offer an automatic adjustment system. 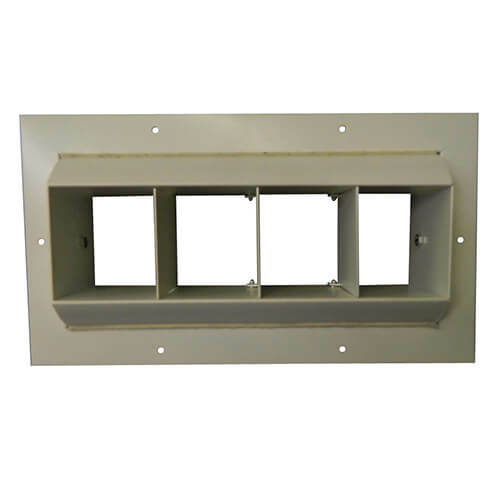 All units are available with Thermostatic (self adjusting) Element. 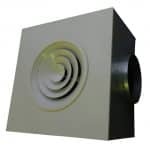 Standard finish on the diffuser is to RAL9010 (White), though it can also be ordered in RAL9006 )Silver/Grey), RAL9005 (Black), RAL9003 (White), RAL9016 (White), Mill Finish, chrome Finish or any other RAL code to suit your specific installation requirements. Additional costs may apply.